See also: Snap Dragon; Wasp. Privateers were privately owned and manned ships authorized by their governments during wartime to attack and capture enemy shipping vessels. Documents called "letters of marque" officially spelled out their authority to equip a ship with arms and seize another nation's citizens or goods. Originally known as "Private Men of War," such vessels came to be called privateers in the seventeenth century, possibly as a shortened version of the words "private" and "volunteer." Privateers have operated in North Carolina waters and off its coast since at least Elizabethan times. After the initial colonization of the East Coast, both American and foreign privateers were involved in the intermittent wars and battles between Great Britain, France, and Spain. They played a significant role in the American Revolution, when North Carolina merchants fitted out their own privateers. Probably the most widely known and most successful commander was Otway Burns of Swansboro. During the War of 1812, he fitted out a fast Baltimore clipper as a privateer named Snap Dragon, armed it with four 12-pound guns plus a pivot gun, and ranged from Newfoundland to the Caribbean. In the first seven months after sailing with a letter of marque, Burns exacted a staggering toll on British shipping, capturing 10 vessels, 250 prisoners, and cargo valued at approximately $1 million. In 1856 all of the major European powers except Spain signed the Declaration of Paris, which made privateering illegal. The United States was not a signatory to the declaration, maintaining that its fledgling navy was inadequate to defend its extensive seacoast. Thus, when the Civil War broke out, both sides fitted out private vessels to attack enemy shipping. In North Carolina, a number of ships were outfitted at Wilmington and operated effectively out of the Cape Fear and Hatteras Inlets. Including everything from schooners to former tugs, pilot boats, and steam packets, they were in constant conflict with the vessels of the Union fleet that were trying to maintain a blockade of the North Carolina ports. American privateering finally ended in 1907, when the U.S. government subscribed to the terms of the Second Hague Conference making privateering illegal. Spain, the last of the major powers to end privateering formally, did so in 1908. Letter of Marque issued by the Continental Congress on October 24, 1776, to James Powell, signed by John Hancock. http://digital.ncdcr.gov/u?/p15012coll11,103 (accessed September 26, 2012). Butler, Lindley S. Pirates, Privateers, and Rebel Raiders of the Carolina Coast. Chapel Hill: University of North Carolina Press. 2000. (accessed September 26, 2012). "The Privateers. ; Doings On The North Carolina Coast." The New York Times. August 8, 1861. http://www.nytimes.com/1861/08/08/news/the-privateers-doings-on-the-north-carolina-coast.html (accessed September 26, 2012). Robinson, William M., Jr. The Confederate Privateers. Columbia, S.C.: The University of South Carolina Press. 1990. 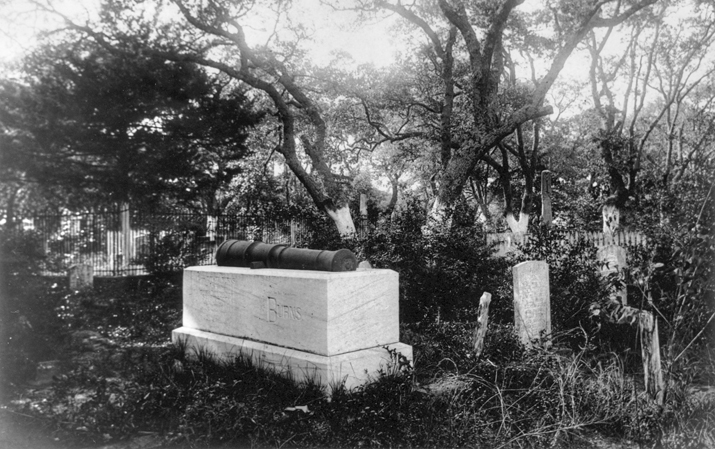 Grave of Otway Burns at the Old Burying Ground in Beaufort, ornamented with a cannon from his ship, the Snap Dragon. Photograph (taken ca. 1898) by Collier Cobb Sr. North Carolina Collection, University of North Carolina at Chapel Hill Library.